Nice and early start again Tuesday morning on the lower beats of the Osprey’s water. Lately i’ve been fishing the higher waters but this morning I decided to check out the lower beats down by upper boat for a change. Not a very nice walk first thing but worth a shot. The weather was perfect really, not to cold with plenty of cloud cover and the wind was non-existent. 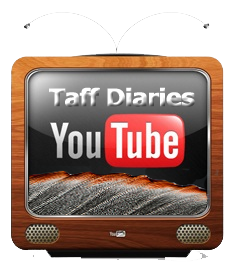 Happy days as I say! The river was running low for a change and clear as glass, it’s been a while since i’ve seen the bottom so clear with all the rain we have been having lately. I didn’t hang around with setting up both rods, one for the dry and the second as always, the french leader. As I was sorting out what flies I was going to use, I could see a few small splashy rises on the far side of the river so I thought i’d have a play around with a small nymph on the french leader. The water was quiet low and slow where they were, so I pulled off around 2ft of 3lb stroft and attached it to the indicator and then a small 1.5 gold head pt. After greasing the indicator I made a few short casts besides a small rock that was on the end of the glide and pretty much straight away the leader slipped away up-stream and I was greeted with a small grayling. 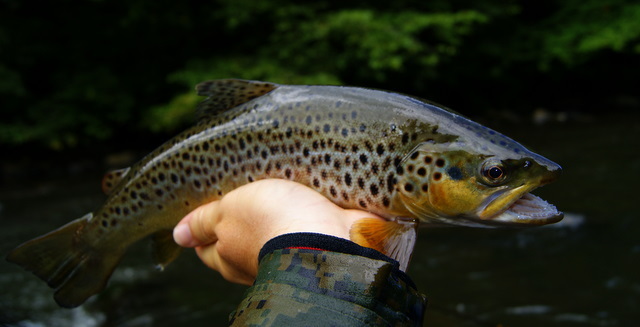 After playing around, catching a few more, I left them to it and moved on looking for a few trout in the little deeper runs further up river. 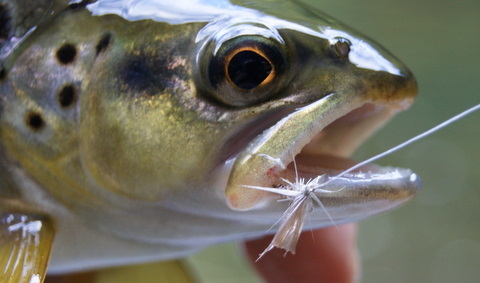 There was no fly life that I could see so I stuck with the nymphs on the leader, just picking my way up through the weed beds with a few trout for my efforts. As the runs got a little deeper I made the set up a little longer and put a dropper in to cover two depths. It was working quiet well with fish falling to both flies so I left the set up as it was and carried on picking up good numbers of trout and grayling. The grayling were not big but very welcome anyway. 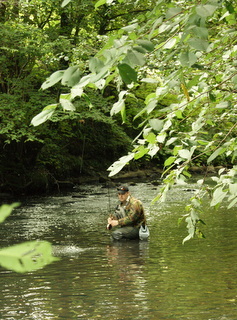 As I moved up river, I could see someone else fishing and when I got close I could see that is was my mate Robert. 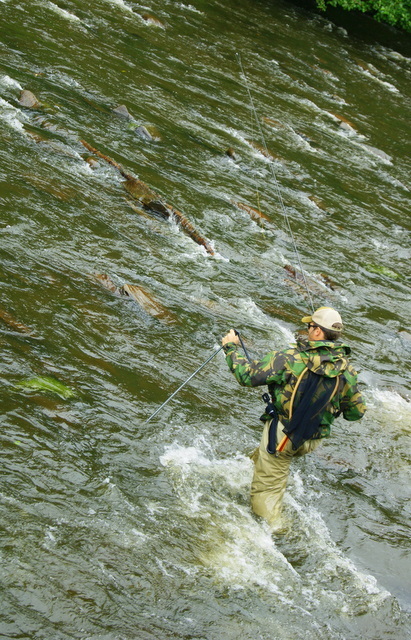 I could see that he was having a little fun on a few fish rising in a long pool. As I got up to him, he was into a grayling and then another not long after. We sat around chatting and then moved on to the next run together. I handed over my 10ft 3wt streamflex and gave a few pointers on using the french leader in the shallow fast run. 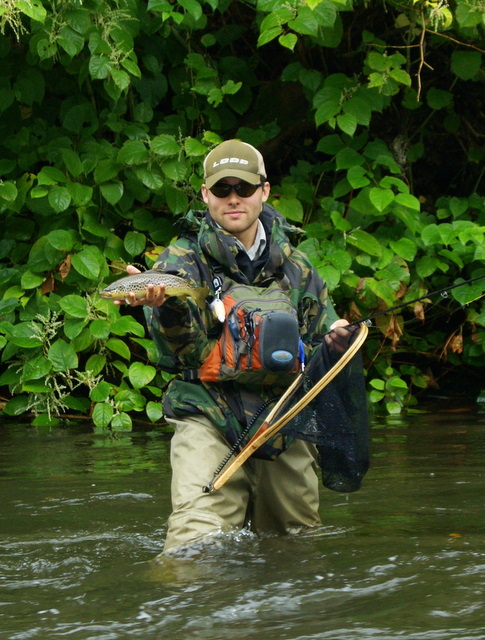 It wasn’t long before Rob was into his first grayling and he took to it like a duck to water really. We went fish for fish for a bit before deciding to make a move up river again and fish anther pool that fishes really well on times. Rob moved in to fish the pool and I made a move up river to leave him in peace so at this point we parted company. 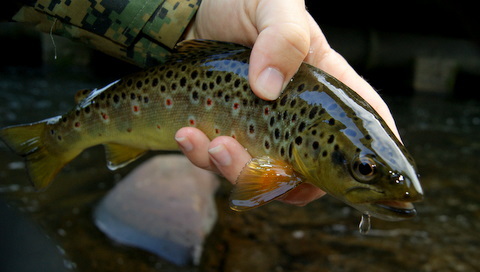 As I moved up river picking a few more trout off with the nymphs and the dry, I had to cut it short because of a phone call. It was a good day and a mixed bag so i’ll leave you with a few photos of Rob and a few more Trout that I had to hand after parting company. 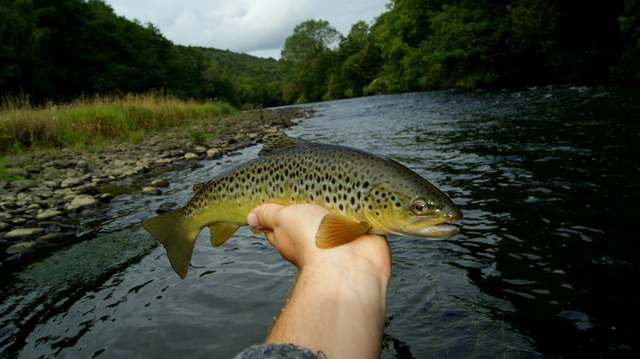 This entry was posted in River Taff and tagged dries, fly fishing, french leader, grayling, nymphs, south wales, Terry Bromwell, trout on August 30, 2011 by fishstalker666. 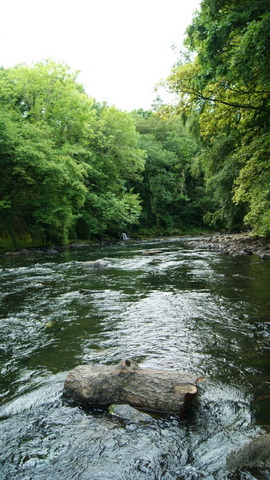 Decided to hit the Taff nice and early this morning and I was on the river for around 6.30. Due to the overnight rain, the river was running with colour and I did think it was be a waste of time on looking at it first but I knew at some point in the day it would clear a little so I pressed on. I didn’t really know where to start on the river this morning due to the colour so I headed up river for the shallow runs and pools that I knew for. On being so early and still quite cold there was no fly life buzzing around so the french leader was set up with only one 2m hares ear jig. Not a very heavy fly but I was only fishing the margins and little ripples and glides, just picking my way up river slowly. 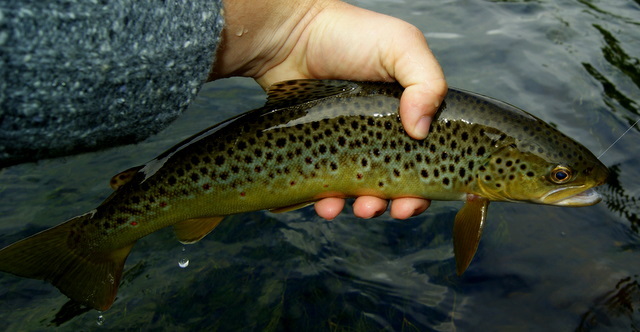 It seamed that I was flogging a dead horse but after covering a few runs I finally managed to catch one small trout in the edge. Not very big but I was very gracious of catching the wee fella in the conditions. By the time I worked my way up river a fair distance without catching a single fish, I decided to sit down and just chill for a bit just watching the water and wildlife. It’s surprising what you see if you open your eyes and keep still. I was lucky enough to watch a King Fisher on the far bank doing what they do best. On this part of the river its quite wide and my zoom on my camera was not good enough to take the picture, gutting really but I am saving for a new zoom lens 🙂 As the morning started to warm up, the fly life started to kick in with a few small olives coming off and I did push a few brook duns off the bank side while walking up river. It was just one of them days on the fishing side. It seemed that the river was void of fish and movement. 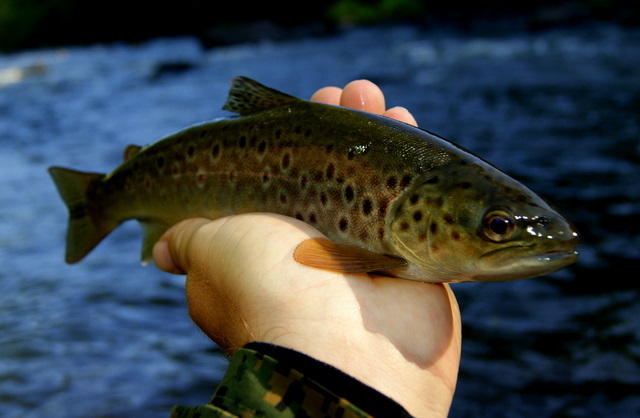 As the day went on with only one fish to hand I was feeling a little daunted and my mind was wandering of the fishing. 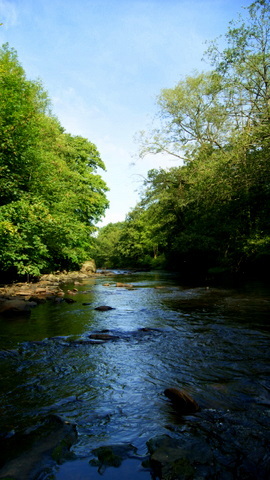 I made one last ditch attempt to find fish by getting out of the river and walking up river a few miles. By the time I got to the place I wanted to be, the river was clearing off nicely. 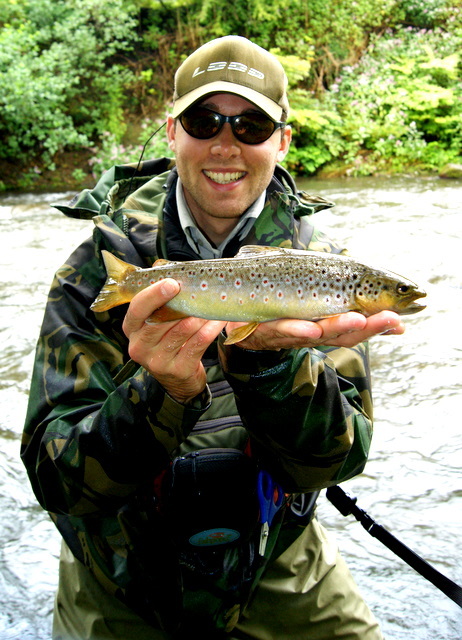 As I was releasing this trout the heavens opened up and I mean it was hammering down to say the least. I took cover for a few minutes until it passed over and carried on fishing. 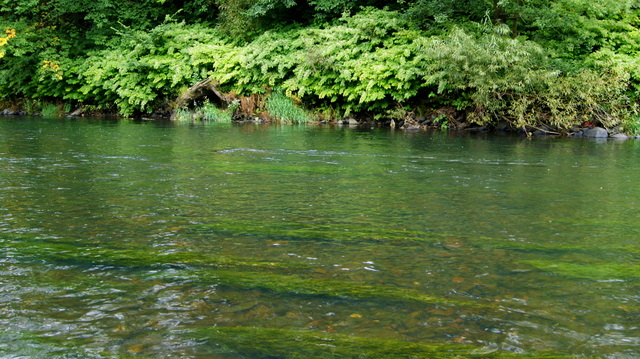 As i was moving on, I came upon a long pool with a few fish rising in the back edge and along the far bank. I slipped the dry rod off my back and set it up with a 15ft tapered leader that Kieron Jenkins kindly got me, for the fly I used a size 16 olive pattern. There were a few Blue wings around and a few iron blue duns. I couldn’t really see what they were taking so i took a chance and after the second cast, the fish took the fly as sweet as a nut!. A few more came to hand after the first one and it was going well until I got to the middle of the pool and for some reason it went dead, so after that I made my way back down river to get closer to home because it was getting quite late in the day. As i moved back down from where I came from I could see a few fish on the fin, so I had a play around before making a move home. 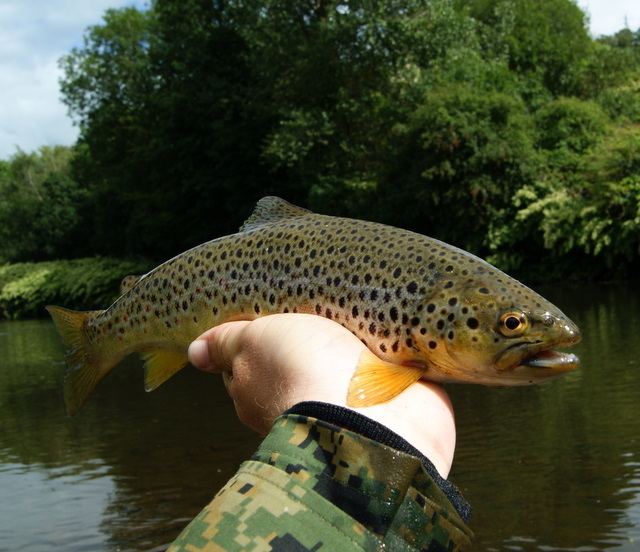 This entry was posted in River Taff and tagged brook duns, dries, fly fishing, french leader, grayling, nymphs, south wales, Terry Bromwell, trout on August 27, 2011 by fishstalker666. 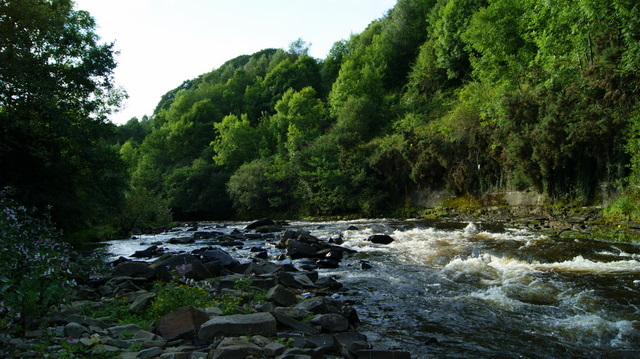 As always the weekends go so fast and Monday morning is on us before we know it but this week wasn’t so bad because me and my mate Nicholas Steedman arranged a trip on the Rhondda mid-week. The morning came and the rain with it! I think he must be some sort of relation to Toby aka Storm-bringer. 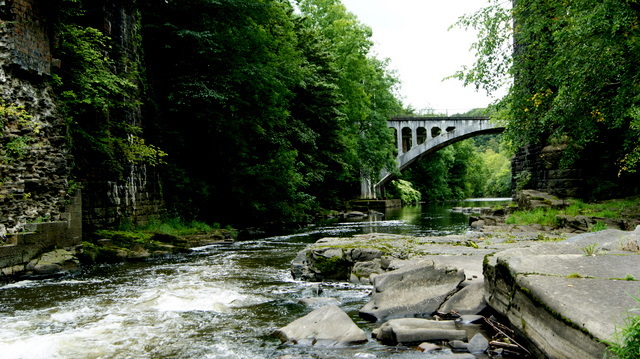 Whenever he tells me he’s coming over the bridge for a trip the heavens open and the rivers rise. Toby& Nick , next time just come over and don’t say nothing please :). Well as I was saying the rain was in and the wind started to pick up and this was all before we even placed a foot on the river bed. 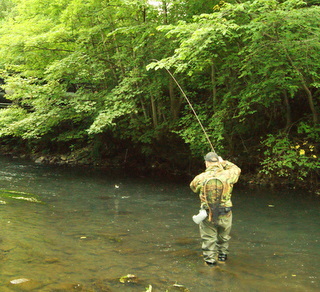 Nick picked me up at 10am and after a quick check of the gear we were off to fish the Rhondda. This was Nicks first visit so I was hoping he would like the river and I had my fingers crossed that the river would perform. 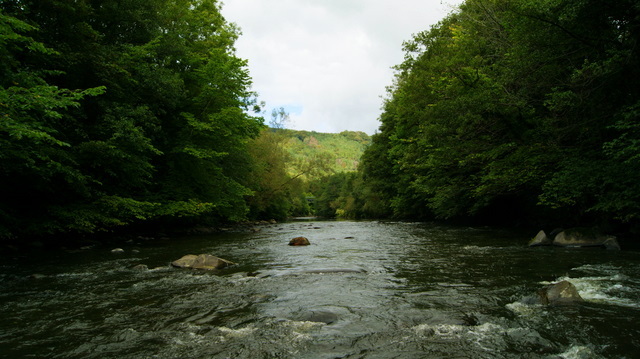 The conditions were not ideal at first and I wasn’t very optimistic of catching because it was up about 6″ and coloured, six inches don’t sound a lot but in the Rhondda it means a hell of a lo., the flow of water is crazy for such a small river. It’s difficult wading at the best of times. 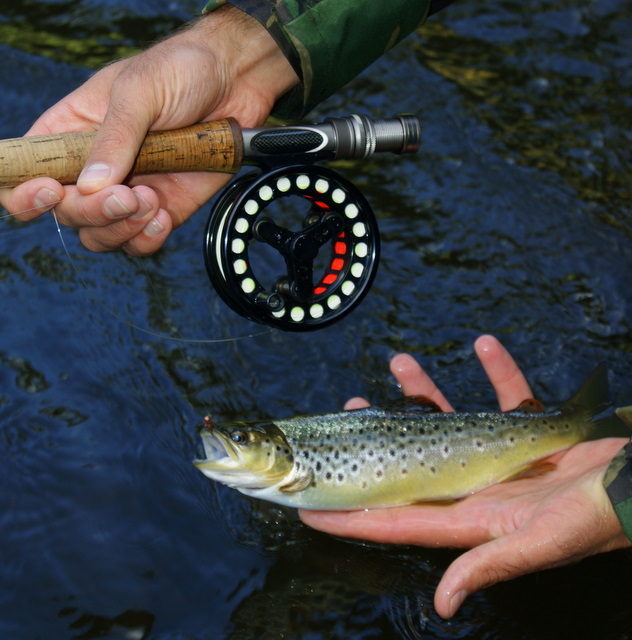 As for the conditions, the dry fly rod was left behind and the bugging rod was the answer. Nick set up the french leader and I done the same and after a quick chat about what flies we were using and depth we moved onto the first run of the day. Myself, I had around 6ft of tipped with a dropper about 18″ from the point. The point fly was a 3m gold head hares ear and on the dropper I had a black 2.5 flash back pt. 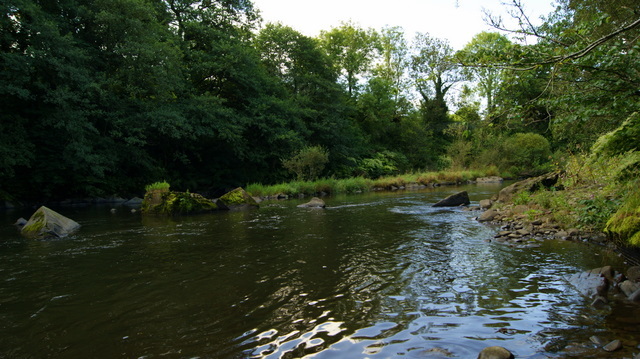 After a few casts with no success I decided to fish the water at my feet and close to the bank. 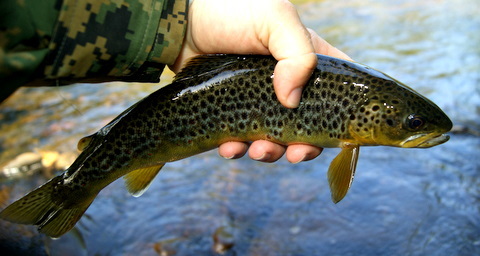 After only a few flicks I was into my first Rhondda trout of the day on the point fly. I stepped back and Nick followed with catching around four trout out of the head of one pool, not the biggest of fish but all were in top condition and their stomachs where all fat. They were on the feed big time. 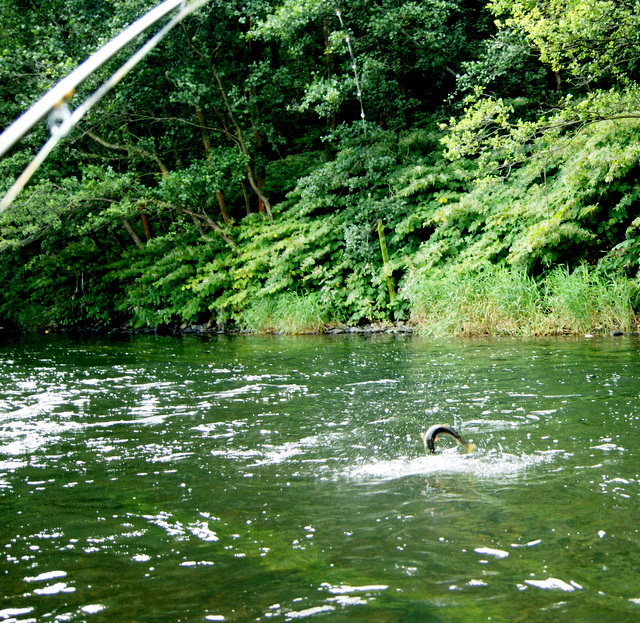 It rained for a few more hours but not hard so the river started to clear up and the fishing just went wild. Nick was taking full advantage of the river, pulling trout from everywhere, the smile on his face said it all, It was a tag team. Nick was fishing the left bank and I was fishing the right bank. 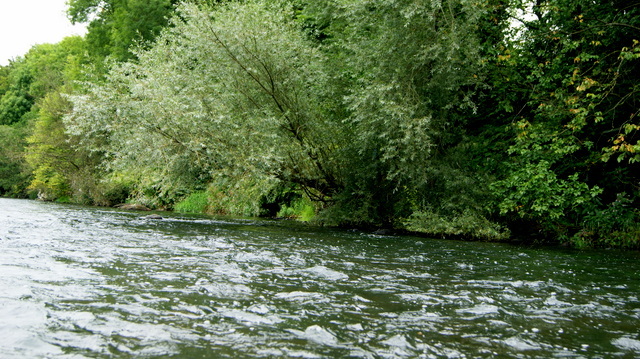 we slowly moved up river taking fish in the shallows and glides. I think Nick was well impressed with the river and the quality of fish. 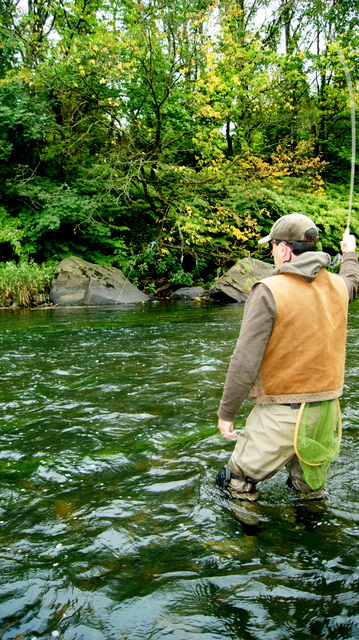 Moving up river into the long runs and deep holes we started to pick up one or to better fish. Nicholas moved on to the right hand side of the river where there was a run along side a wall, it didn’t look deep but looked a good spot for fish to lie up out of the current. It was one of them spots where there was nothing else to hide behind so he was on a winner. He caught 5 trout that I seen so he was on the ball fair play, nice going Nicholas. 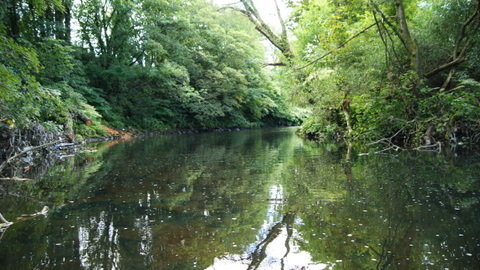 As that little spot went quiet we slowly fished the ripply water leading up to a small weir. 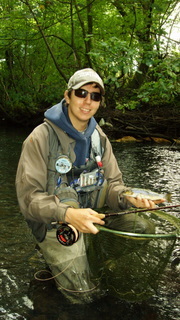 Nicholas moved in for the kill and had five cast and five fish. It was really good to watch. After dragging him out of there 😉 we moved on up into a pool where I’ve had some amazing fishing in the past in a similar condition. I had the first few casts this time and managed a few before Nicholas moved in. After taking a few out at the back edge, Nicholas pitched his nymphs into the main flow and as the leader was going through the run, the leader stopped and he lifted into the take but it just stopped dead! His rod was double to say the least and all this time the pressure was on and there was nothing he could do. The line just went across the river and so slow you could see the line going back and for, it was a big, big fish. The pressure he put on didn’t even change the fishes mind, it was like it didn’t even know it was hooked. It moved across the flow and went into a snag and that was that. I feel for you brother 😦 I’m still gutted. 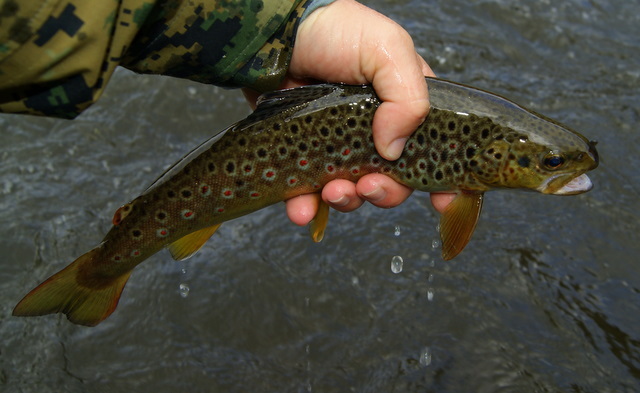 Would have been great for you to catch a monster on your first outing on the river. There is always next time and ‘im sure you will be back soon. I’ll leave you on that and here’s a few photos of the great day we had. 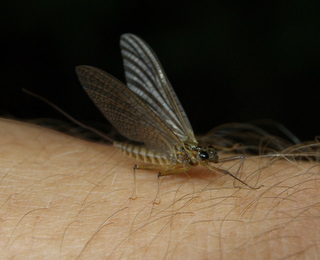 This entry was posted in River Rhondda and tagged flyfishing, french leader, nymphs, Rhondda, south wales, Terry Bromwell, trout on August 17, 2011 by fishstalker666. 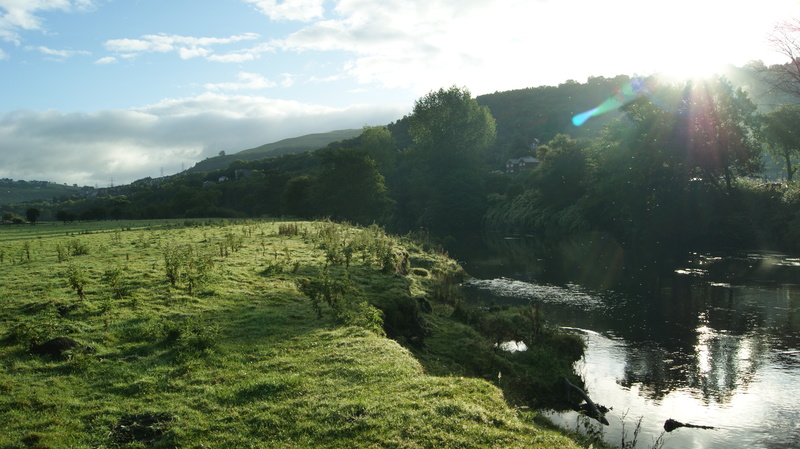 I was up at the crack of dawn this morning all set to fish the Rhondda in its low state. The weather was not looking to good first thing this morning with heavy cloud cover and a little bit of a chill in the air, but by the time I got on the river and set up my greys 4wt with the dry and my streamflex 3wt with the french leader the cloud started to disperse and the sun started to make a show. As I said the river was very low so a stealthy approach was needed, this is where the french leader comes into its own by enabling you to cast the nymphs well up-stream and keeping minimal drag for presentation. At the moment im using a 21ft camo leader so i can cover a lot of water without making a step. Enough waffle, back to the fishing. It was all slow-moving, just picking through the pockets with a 2m flash back PTN. In no time i was into the first trout of the day and after that many more came to hand on the leader. I didn’t see any fish on the fin so the dry rod was on my back and that’s where it stayed most of the morning until around 12ish when a few brook duns started hatching and a few B.W.O and a few other upwings that I could get close enough to identify. As i moved around the Rhondda picking a few fish up from the small pockets and glides i decided to take a bit of a break and turn a few rocks over and see what was going on. I didn’t have anything on me to put the nymphs in so i improvised with an old can that i found on the back side. Worked a treat too. I found mostly stoneclingers and a few cased caddis and small lava of some sort and a few snails. I only took photos of the stoneclingers/Heptagenid below. 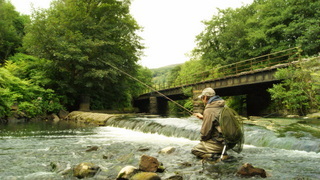 This entry was posted in River Rhondda, River Taff and tagged flyfishing, french leader, grayling, nymphs, Rhondda, river taff, south wales, Terry Bromwell on August 9, 2011 by fishstalker666. I had a phone call last night off Kieron jenkins asking if i would be interested in fishing the Cynon with him. I’ve never fished the river before so it was a good opportunity to have a look and it’s always an experience fishing with Kieron to say the least ;). 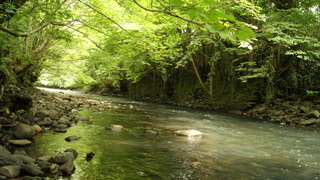 After a quick journey on the train in the morning, i met with kieron and off we set to fish the Cynon. 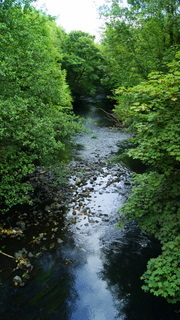 Seeing the river for the first time kind of reminded me of the river Rhondda but not has rocky. I couldn’t wait to set up and get a fly in the water like always. 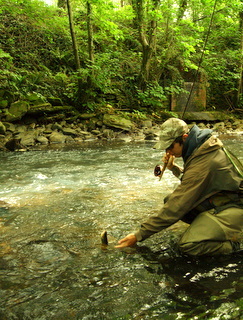 As we havent had much rain for the past few weeks, the water level is very low so we decided to go for fish for fish. I set up on the dry, Size 16 cdc olive and Kierion set up the french leader. 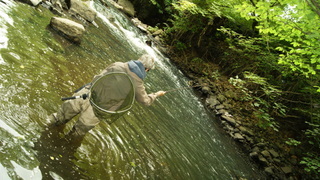 With the conditions, using the leader, kieron pulled off around 3ft of nylon and attached that to the indicator and then from there the nymph, he used a 2m flashback ptn. 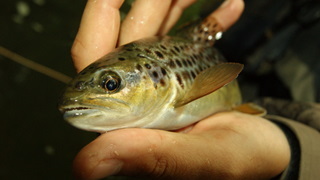 Cracking all round pattern for any river and conditions. The weather seamed to be holding for us with heavy cloud cover and the odd glimpse of sunshine breaking through and the odd small shower. As we moved up river seeing a good few fish rising we thought it was going to be like shooting fish in a barrel, but it wasnt to be. They were highly spooky and just didn’t want to know the dry. We came to the conclusion that they must have been picking up midges or something. Kieron tried all kinds of flies but only managed one. Just one of them things i think. The leader was more effective so that’s what we did for the rest of the day with the odd flick of the dry with no success. 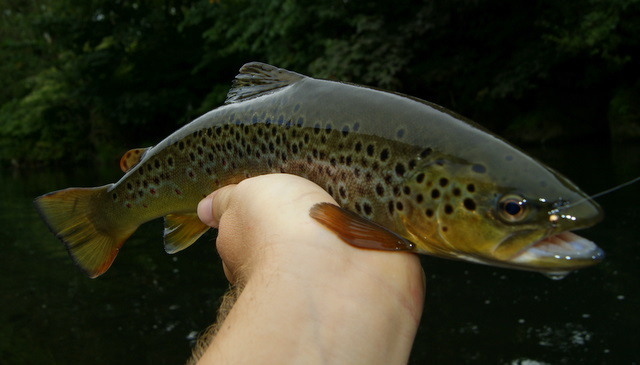 There were a few sherry spinners around, a few Blue wing olives and the odd brook dun but it didn’t help with the dry fly fishing so we just kept on plugging away with the nymphs picking a few more trout out. At this time it was getting quit late in the day and we were both running low on energy so we called it a day. 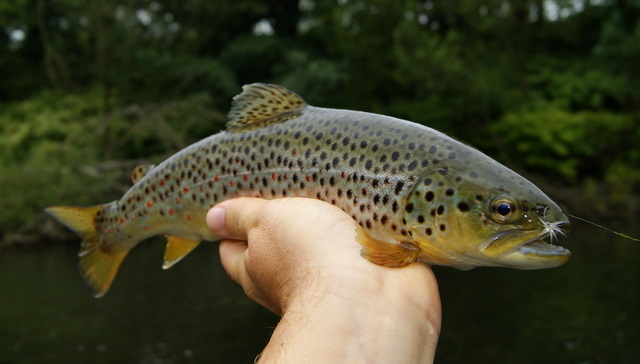 This entry was posted in Uncategorized and tagged brook duns, f, fly, flyfishing, french leader, nymphs, south wales, Terry Bromwell, trout on August 6, 2011 by fishstalker666.